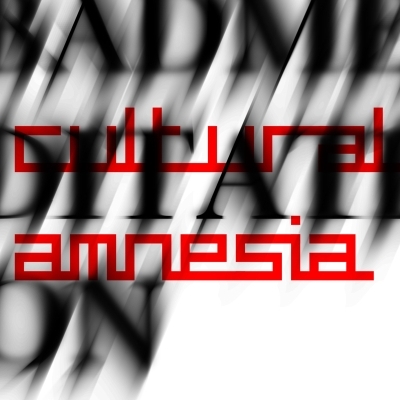 Bad Meditation is the first album from Cultural Amnesia since 2011’s This Is Not Your Shape (also on Bleak). But the band have been busy and Bad Meditation is the first of a series of four releases of new material to come over the next few months – all on Bleak! As listeners know, CA were first active at the start of the 1980s, emerging at the end of early industrial music and the beginning of postindustrial, amidst the rise of electronic music and the adventurousness and energy of postpunk. There’s no doubt that there is continuity between their 1980s output and the new material. The personality of the band remains the same. But this personality is one that does not identify with any one genre and has no interest in retreading old ground (although amongst the new recordings there are occasional lyrical and musical quotations from their former selves, and also a couple of tracks that incorporate loops or backing tracks recorded in the 80s). In fact with regard to their early milieu and the cassette scene of which they were a part, it seems exactly its spirit of creative freedom and experimentation that CA continue to pursue. Along with Bad Meditation, Bleak is also releasing Still Hungry, an EP of 1980s material. It was first released on vinyl by VOD Records in 2007 in an edition limited to 250 copies. Three of the four tracks were previously unreleased. Included is a version of ‘Scars for E’, one of the songs written for them by CA’s friend and mentor John Balance. This is the first electronic release of the EP. Both releases come with a lyrics booklet, and there is a video for each – only the second and third official videos from the band (the first accompanied This Is Not Your Shape).